Parents are often hesitant to switch to big kids toothpaste because their toddler, or preschooler, won't spit when brushing their teeth. Moms and dads are worried about harm from injesting fluoride. Up to 2014, dentists recommended switching at age 3. The new recommendations are to use a fluoride containing toothpaste as soon as teeth come in, but only to use the amount of a grain of rice. Have you ever tasted baby toothpaste? It's yummy, it's a gel, and it doesn't foam. No wonder kids want to swallow it! It certainly only trains children on how to eat toothpaste, not spit it out. If I wanted to teach my toddler how to spit, I would make beet flavored toothpaste. Or brussel spout flavored toothpaste would do it. My good intentioned attempt would only get so far as she would see the red or green stuff coming and clamp her mouth shut and become a wet noodle. Let's not be mean, we are already trying to get them to like vegetables at dinner. Instead, try different flavors, there are so many to choose from that one will satisfy even the pickiest of toothpaste flavor conseseours. 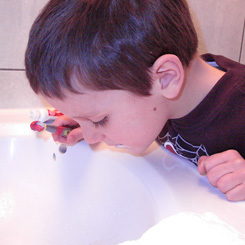 When children are about three and can spit, then increase the size of toothpaste to a pea-sized amount. The goal of all this is to prevent the most common childhood disease, dental decay. Did you know that decay (or cavities) are completely preventable? Let's help the young children stay cavity free, don't you wish that was the case for you. For additional questions, ask your dentist at your next visit to Life Smiles family dentistry in Plymouth, MN.